Okay, So here is the blurby bit from Goodreads. I'm not really sure where to start with this review. There where so many things that I loved about this book, and a few things that didn't do it for me. I'll start with those. There where two things really that got to me. The first was Emilie. As much as I loved her as a character, I found her rather passive. I'm not sure if that was because this book is written in the third person or not, though I'm sure that contributed. There where moments when I wanted Emilie to do more, to say more, to be more involved with what was going on around her. We spend a lot of time watching Emilie watch what is happeneing around her rather than watching Emilie take action and move the story along. It didn't detract from the book as a whole for me, this is only a small niggle, but it was enough for me to mention it here. The other thing that struck me was Emilie's age. I don't specificaly remember finding out how old she is, though other reviewers have said that she was fifteen, so I'll go with that. She comes across as both much older and much younger than that. Her actions and the way that she interacts with the other characters makes her seen younger than she is, where as her thoughts and internal dialogue suggest a maturity beyond her years. Again this did not detract from my enjoyment of the story as a whole, but I thought it was worth a mention. Now on to the good things, of which there are many! Hmmm where to start? Even with what I said above, I LOVED Emilie! She is smart, strong, brave and I wish I was more like her. She is full of wonder for the things that she sees and has an astute outlook on what is going on around her. I found her a joy to follow through the pages of this story. I loved how capable she was, how fierce she could be and how relatable she was. I was hooked from the first page! The plot starts right away, with Emilie trying to stowaway on the Merry Bell, a ship she hopes will take her away from her family and to a new life with her cousin. Only things don't work out that way and Emilie finds herself on the Sovereign, at the start of an epic adventure that is about to change her life. Emilie soon finds herself in a world that is rich with its own culture and people. The other characters in this book are not your standard secondary characters, each one is fully realised and fleshed out with their own quirks. I loved the two Cirathi characters, Rani and Kenar. They added an extra layer to this story that I really enjoyed. I loved the feel of this book to. It had a Steampunky aspect to it that totally appealed to me! 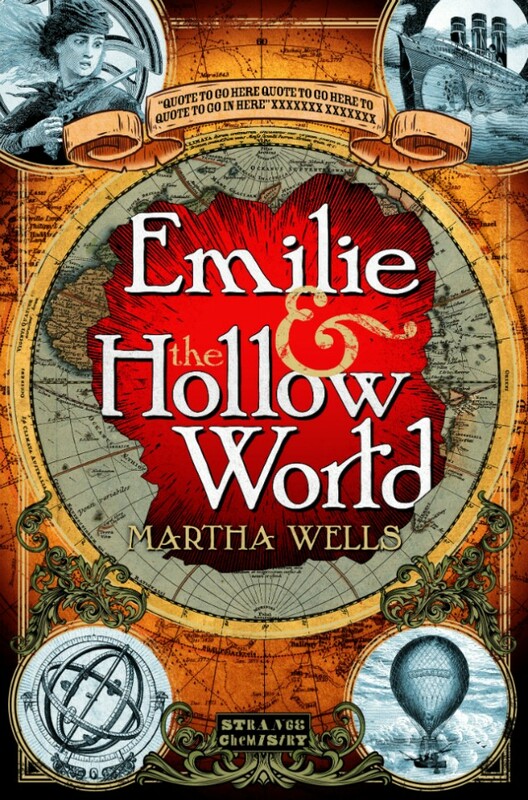 I am a huge fan of ANYTHING Steampunk :) I am also a fan of the way that Wells has used the fantasy aspects of this book to tackle some important issues in a very subtle and non threatening way. Emilie at no point sits back and waits to be rescued, in fact she does a lot of the rescuing herself! lol There is a strong feminist message in this book but it's not in your face. As I said before it is subtle. Wells has used her strong female characters, and the way that some of the male characters view them, to explore the nature of sexism and inequality while showing that men and women are in fact just as capable as each other. It has been cleverly done and I think that both guys and girls would respond well to it. The other thing that I liked was the large and diverse cast. The North Menaen are described as fair with pale skin, while the South Menaen are described a having much darker skin, warm brown, with brown hair. Emilie herself is South Menaen. There are not that many YA books with a non-white MC, let alone YA fantasy books. While there are no racial tensions between the North and South Menaens, Wells still manages to tackle the issue of racism. She does it by using the interactions between the Menaens and the other races of people that they encounter in the Hollow World. Again this was done in a subtle and accessible way. It still got the message across without being obvious. This brings me nicely to the skill of Wells' writing. The way she used description was beautiful and made it easy to picture this strange world in your mind. The words flow wonderfully from page to page and had me on the edge of my seat at times. I have jut looked on Goodreads and seen that there will in fact me a second chapter to Emilie's story and I for one cannot wait to see what happens next. If you like fantasy books or if you're just looking for something new and different to read, then I thoroughly recommend this book!